Sunday the 3rd of April saw the first proper day of spring this year. 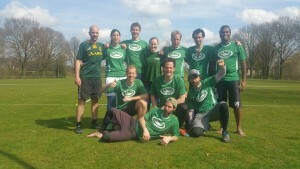 With the sun shining and low levels of wind, it was the perfect day for the tournament, hosted by Tilburg’s Flying High. The four teams were well matched and most of the games were evenly contested. It was surely only by the shear intimidation of our spirited war-cry that allowed us to finish the day with 3 wins and no losses. Kudos to the BFrisBee2s whose spirit, grit and determination ensured that each of their games culminated in a universal point whilst playing savage for the entire tournament. 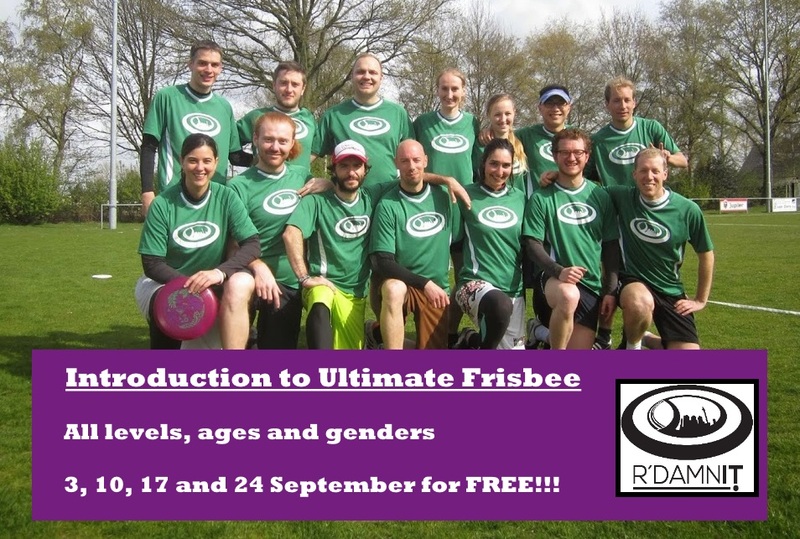 In April we welcome inexperienced players to join our introduction trainings to learn the basics of Ultimate Frisbee FOR FREE. EVERYONE WELCOME!!!! ALL GENDERS, ALL AGES, ALL PHYSICAL CONDITIONS !! 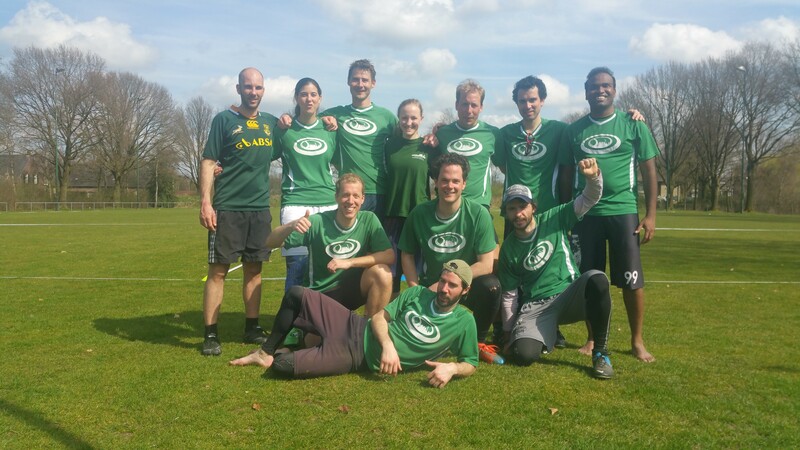 Rotterdamn’it drove early to Arnhem last Sunday with great hopes of doing well in the second bracket of the indoor competition (9th-16th). 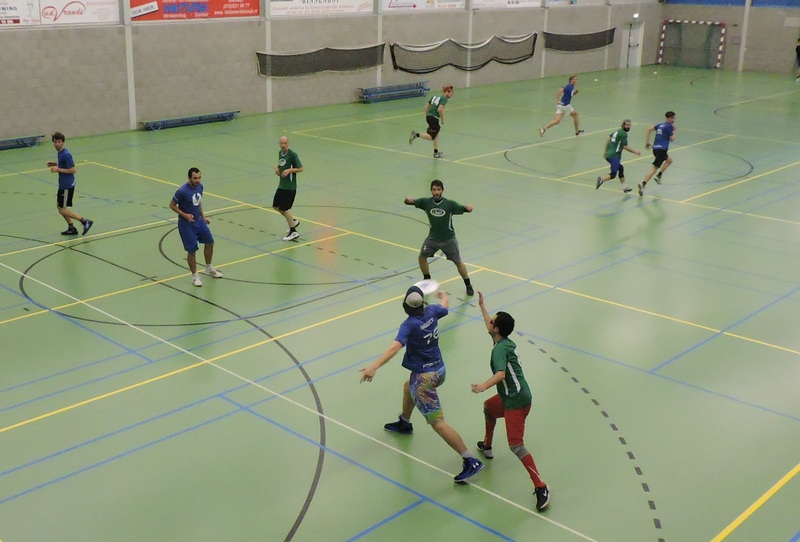 A solid team of 7 composed of Arend, Stoyan, Peter, Vincent, Joep, Deepak and Oscar. For once we had some height in our team. Our start in quarters was not as we hoped for against the Vellesan Speedy’s. Lack of precision in offence was a constant over the match, which combined with low intensity in defense, lead to a well deserved 11-8 loss. During the long long break between matches we learned a nonsense card game from Peter. The rules and the direction of the play kept on changing as our master saw fit. Great fun though. Before the semis, and putting the playing cards to better use, we planned a zone defense to put to the test in the coming games. We felt a bit down after having played our first match well below our level. We were ready to prove we could be better. Our next opponent was NUTS, against who we lost out last match of the previous competition day. Unlike our previous match our offence clicked and we had flow in our attack. A successful zone gave us some turns early in the game to gain a lead that grew until we reached a final score of 11-3. The point difference was big but it did not feel that way on the field. 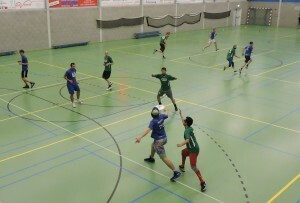 Always very nice to play against the Amsterdam university team. A somehow shorter but still long brake after it was our turn to face the Veenendaal Tijgers for the 3rd time this season. I cannot tell the scores of any of the previous games, but they have always very close matches with intense defense being the key to the game. This time was not going to be different. This game was played in the main field with quite a crowd watching (or talking or reading, but you know, present) which gave an extra sense of relevance to the game. We started solid on offence and managed to chip away some break points. This short lead was maintained during the game with great offence and very focused defense. For once we were winning some air battles against a team that masters the high discs (Peter and Arend owned the skies). Final score was 7-12 for us, closing this season in a 13th place, the best we could do after losing our first match. On the bright side, we ended up 9th on the spirit ranking, which over 40 is not bad at all. Rotterdamn’it joined to celebrate the new year with the cheesy excuse of… well, eating cheese (sorry for that). After our successful tournament on the 15th of November, the second Indoor competition day came upon us much quicker than anyone had expected. Despite the good team cohesion and the home ground, the anxiety was high as we were not sure if we can match our performance against a much tougher opposition. Our first game was against our friends from Force Electro, who were set to test us to the limits as the favorites to win the competition. Despite the formidable opponent, we played our own style and our offense was unwavering. We kept our composure for the first 25 minutes of the game and turned this into a neck and neck opening to the tournament. With only few minutes until the end, the game was tied at 6:6 and it looked like it could go either way. Unfortunately, a few lapses in concentration cost us dearly in the final minutes of the game and Force was able to convert a few quick points in succession to get to the final score of 7:10. Despite the loss, we were heartened by the fact that we played as equals against a supposedly superior team. As it turned out Force Electro went undefeated throughout the day and we came the closest of all teams to beating them. The great opening gave us wings and we swooped through the second game against WAF1. It was a very spirited game in which we continued to play our fast-paced handler offense and dominated the game from very early on. Despite WAF1’s best efforts we took the win home with a convincing score of 12:4. Our next game against Veenendaal Tijgers Open was by far the closest and most competitive game of all that were played today. Through the day we could see that the Tijgers were really practiced at playing Indoor style and showed some incredible hammers, scoobers and blades as well as some sick layouts. We were definitely in the position of the underdogs, but we showed that dogs can also bite. We held our own on offense and we pushed them to the limits with our energetic defense. We both fought fiercely for every single point and as a result neither of the two teams went ahead by more than 1 point at any given time. The game went back and forth until at 10:10 the siren sounded with R’damnit in possession of the disc and the chance to finish off the golden point. Unfortunately, we were denied a hard-fought victory by a momentary loss of focus and a stray scoober that the Tigers pounced on to make it 10:11. The closing game of the day was against Spinners1. Even though it was a physical game with relatively more body contacts, calls and stoppages, it was also a good one. Throughout the first half of the game we gained a lead of about 3-4 points and managed to maintain it. It seemed that during the last 10-15 minutes of the game we didn’t have the legs to press our advantage and to make the score line even more convincing, so we were content to keep playing point-for-point until the end. The final result was 10:6. In the aftermath of these 4 games, it became clear that our promotion from division 4 was well deserved. Even though we came in to the tournament as underdogs, we managed to dominate 2 of the teams and to give the two best teams in the competition a run for their money. If anything, we proved that when we come together and play with energy, confidence and desire to win, we play as equals even with the best of teams. We are confident that no team in Division 3 will underestimate us the next time that we meet on the field. Big news everyone! Yesterday R’damnit went undefeated (4-0-0) in the first indoor competition of the 2015-16 season. 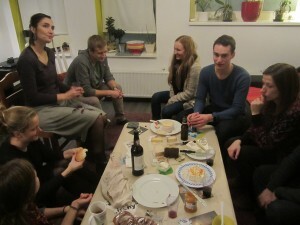 We were joined by Tilburg’s own Flying High, NUTS, Vellesan Speedy’s, and Panic. Although the point differential increased in the latter two games, it does not reflect the intensity of the matches — (this is especially the case for NUTS, who despite scoring the least against us, was probably the most capable of exploiting our defense). Thanks to everyone for showing great spirit and bringing some high-caliber ultimate. If we continue this trend R’Damnit will become a solid club team. To finalize the 3th year of the club R’damnit a members meeting is planned on Thursday October 15, 2015 at 21:00. We will send you more details (agenda, minutes, etc) at a later time. Your presence is highly appreciated at this meeting! If you are unable to join this meeting, please let us know. Rotterdamn’it played last weekend the Hargen Beach Tournament. 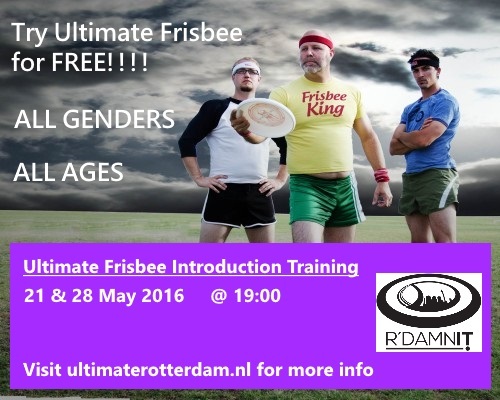 The roster included three Force players (Robbert, Anouk and Laurens) and Marijn that joined us again. We were able to some how gather most of the team 5 minutes before the first match against Viva l’Olandesina. Most of us did not have the possibility to train our throws before getting in to the game, which lead to many imprecisions in the early minutes of the match that left us with a 0-4 against. From that moment on we started trading points to end with a disappointing 4-7, leaving everyone wondering what the result would have been if this was the second game instead of the second.